If you’ve been following this blog from the start, you are aware that I was out in Harrisburg for 2 1/2 weeks back in September. One of the great places I came across there was the Broad Street Market. It’s your typical farm market with fresh produce, meats, and good home cooked Amish food. There are two buildings making up the Broad Street Market. The front building is just eateries, while the back is a mix of everything. The place I went to for lunch was called L&L Country Meats. I got standard Amish farm market fare like fried chicken, mac and cheese, and potato wedges. Ahh, they were delicious. The potatoes could have been crispier, but it was a cheap, delicious meal. 1. Candy Cigarettes. Maybe I could find this elsewhere just as easy, but I’m never looking for it. Stoltzfus Candy had these! I haven’t seen these in years and it’s not really a big deal, it’s just that I have a nostalgic attachment to them. They also remind me of Halloweens when I was growing up. These are sugary sweet….just like the stick in Fun Dip. 2. All Sport sports drink. I recently (within the last year) had a conversation with a friend about sports and somehow the All Sport sports drink of the 90s came up. How funny and crazy that we both remembered this awful tasting and from what I remembered, carbonated? A carbonated sports drink you say? That’s not right… I swear, that’s what I remember. Anyway, after my friend and I had that conversation, I tried to find this drink in local supermarkets around (Shoprite, Wegman’s, Giant) but no luck. Of course I just assumed that it truly was that bad of a sports drink and was just discontinued. When I passed by one of the Amish eateries, I noticed that in one of those drink coolers in the back, there were at least 3 shelves of three different flavors of All Sport! I did a double take, since I couldn’t believe it. Immediately I bought two, one for aforementioned friend, and one for myself. Unfortunately when I sat down to drink it, it was not carbonated whatsoever. Was I imagining things? or has the product changed since the mid 90s? It was however still pretty bad. I’ll gladly take a Gatorade or Powerade over an All Sport any day. Hey, it was worth it for that feeling of nostalgia. I just googled “all sport carbonated” and did find out that it was INDEED carbonated back in the 90s! I wasn’t wrong! Sigh, that carbonation definitely woulda taken the cake. So this is something I wanted to blog about a while ago but just couldn’t find the time. Two weeks ago I was in Harrisburg for 3 weeks of training. 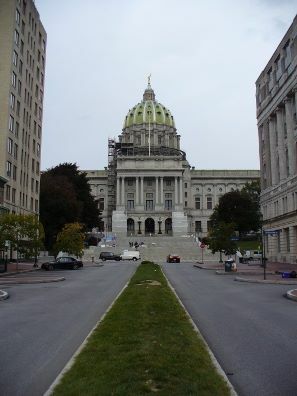 I’ve never been to Harrisburg prior to that visit, so I definitely walked around a bit. It’s small, not quite as city as NYC or Philly, but it’s not bad. I found some good eats (will post about some soon) and some friendly people. My favorite thing was probably the many bridges that cross the Susquehanna River. It’s just beautiful. Just three of the many bridges that cross the Susquehanna. I bet all of you (or the few of you who read) were wondering when the hell bridges were gunna be blogged about….well, here ya go! Tonight, I went into Harrisburg to try Moroccan food for the first time. La Kasbah is located just off of 2nd Street. (The building is kind of recessed in, and even though you see the sign, you don’t see the restaurant unless you’re right in front of it – I definitely missed it the first time around.) It’s a family owned place run by a father and son from Casablanca. La Kasbah’s dining space was very cozy and intimate. The walls were yellow/gold with scattered reds from the furniture, wall décor, and table napkins. Having two dishes in my mind already, my server helped me decide and I went with a lamb tagine with a side of couscous. The server came out in a couple of minutes with a basket of thin, warmed pita quarters with country crock (really?!) and harira (Moroccan soup). The pita was good, I didn’t use any country crock…just not crazy about that stuff. I figured there woulda been hummus or oil or something… The harira was tasty. There were chickpeas, lentils, and vermicelli in it. I would say that it had a minestrone sort of feel to it. The lamb tagine and couscous came out in, well…tagines. Tagines are the clay pots which are used to cook the meal….hence the name. The fork tender lamb was fantastic. It was accompanied by caramelized prunes and topped with sesame seeds. I’m glad I left some pita to use to sop of some of the delicious goodness left in the tagine. The couscous was pretty good as well. At the end of the meal, the server had given me a Moroccan tea on the house. It consisted of green tea, mint, and orange blossom. I’m not quite the tea drinker, but I enjoyed this a lot. The Moroccan tea was a great way to close out the meal. I’m definitely bookmarking this place for any future visits to Harrisburg. P.S. – They also have bellydancing on the weekends!